TORONTO — As anti-poverty advocates denounced the Ontario government's decision to scrap a basic income pilot project, the province defended the move Wednesday by suggesting the program discouraged participants from finding work. 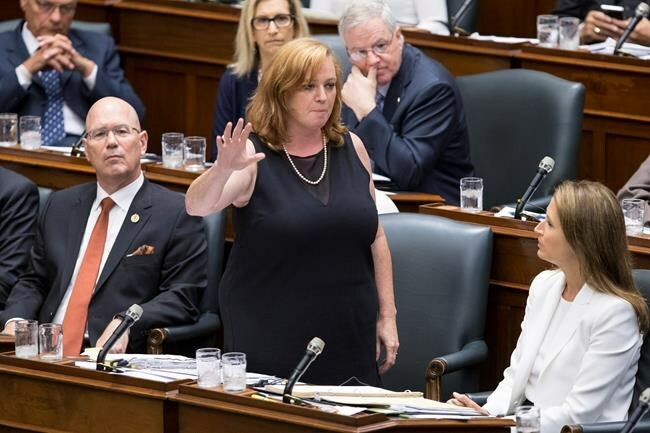 Though the Progressive Conservatives had promised to preserve the pilot project, Social Services Minister Lisa MacLeod said the government reversed course after hearing from ministry staff that the program didn't help people become "independent contributors to the economy." Statistics released by the previous government showed 2/3 of those enrolled had a job. "I knew it was coming every month," she said. Now, the family will have to go back to living day-to-day, Dean said, adding she won't be able to enroll in fall classes. "I know several girls that are working poor who have walked to work because they couldn't afford the bus. Did they quit their jobs because they got basic income? Hell no," she said. "Another is still working her job but now it allows her the freedom to take the bus instead of walking an hour and a half. She may lose her housing now." "This is the government taking a political course of action without thinking things through the ramifications (for) these real people who have huge stresses in their lives now." The Ontario Coalition Against Poverty, which had been critical of the project, said cancelling it only a year in "demonstrates a reckless disregard for the lives of nearly 4,000 people...who planned their lives on the assurance of having a set income for three years." The New Democrats and the Liberals also suggested the governing Tories would erode supports for low-income residents. NDP legislator Lisa Gretzky, the party's social services critic, said the government had pulled the rug out from under vulnerable Ontarians and would likely continue to do so. "There's nothing compassionate about cutting planned increases to assistance rates, and cancelling the universal basic income pilot shows that this government has no interest in making progress when it comes to improving the social supports that many Ontarians depend on," she said in a statement. Green Party Leader Mike Schreiner, meanwhile, said the basic income program had previously been touted by conservative economists, who saw it as a small-government solution to help people out of poverty. Advocates for basic income initiatives said such programs are more effective in lifting people out of poverty than social assistance and require less bureaucracy to run. Sheila Regehr, chair of the Basic Income Canada Network, said demographic groups such as seniors and parents with young children receive support that follows the basic income model, with better outcomes than social assistance. Basic income programs give people "the ability to have some security, to have some autonomy, to have the feeling that you're in control, that you are making decisions that are best for your life, not some bureaucracy that thinks it knows best," she said. "It's not just about money, it's about security," she said. "It's knowing that no matter what else happens in life, you've got something that helps you deal with that."